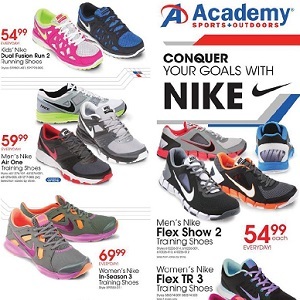 This week Academy Sports weekly ad, circular and sales flyer. The ad is simple, easy to use and has great deals that can save you money. Find great deals, sales and offers on Academy Sports weekly ad, such as: Intex Round Metal Frame Pool Set; Char-Broil 6-Burner Gas Grill; Jump Zone 14′ Round Trampoline with Enclosure; Mosaic 6-Piece Folding Patio Set; Mosaic 9′ Round Steel Market Umbrella; Mongoose Montana 26″ 21-Speed Mountain Bicycle; Magellan Outdoors Falls Creek Dome Tent; Igloo Ice Cube Rolling Cooler; Lowrance Elite 4 DSI Fishinder/Chartplotter; Skechers Men’s Diamondback Leroy Shoes; Yeti Billboard Logo Short Sleeve T-shirt; Magellan Outdoors Highland Cargo Short; Oakley Men’s Sector Golf Shoes; adidas Men’s adizero Sport II Golf Shoes; TaylorMade Rocketballz Hybrid; Wilson Men’s Tour Velocity Golf Set; Wilson Staff Ci Iron Set; PGA TOUR Airflux Solid Performance Polo Shirt; Reebok Kids’ Ultimatic Running Shoes; adidas Climalite Short Sleeve T-shirt; Under Armour Men’s Running T-shirt; adidas Men’s Madison Running Shoes; Under Armour Women’s Assert IV Running Shoes; Nike Air Velocitrainer Training Shoes; Triumph 400T Treadmill; Reef Fanning Sandals; and more. All Academy Sports stores activate their latest weekly ads on Sunday. Academy Sports + Outdoors is a premier sports, outdoor and lifestyle retailer with a broad assortment of camping equipment, sports and leisure products, footwear, apparel and much more. The Texas-based company operates over 175 stores throughout Alabama, Arkansas, Florida, Georgia, Kansas, Louisiana, Mississippi, Missouri, North Carolina, Oklahoma, South Carolina, Tennessee and Texas.